Most pulp historians believe that of the hundreds of thousands of covers and illustrations produced for the pulp magazines of the 30s and 40s, only ten percent or less survived. At the time they were done, no one realized their cultural significance to the history of American art and all these amazing drawings and painters for trashed after publication. Today that small percentatge that miraculously avoided the dumpsters remains in the hands of private collectors. It is a shame there was no Robert Deis or Wyatt Doyle around in those days. With the advent of World War II the original pulps were severely curtailed by paper shortages and by the war’s end many of them had vanished. It looked like the age of populist literature was coming to an end. Happily that was not the case as several enterprising publishers brought about a new pulp evolution by creating magazines geared primarily towards the millions of returning veterans. Thus the small pulps of old morphed into the Men’s Adventure Magazines (MAMs) of the late 40s, 50s and 60s. Of course many of the old pulp creators hopped aboard this new literary format, but for the most part MAMs saw the infusion of many new writers and artists. These talented people were only too happy to continue the tradition of fast paced action-adventure storytelling. And just like the old pulps, they were lavished with beautiful and exciting artwork geared to get the reader’s blood pumping. Here were two-fisted men daring any challenge as they traveled the globe seeking adventure. Of course along the way they always encountered buxom, leggy women in torn garments emperiled by various nasty villains all too eager to ravish and destroy them. This being post-war, those monsters were often Japanese or German torturers. The covers were garish, outlandish and beautiful. While the interior illustrations just as exciting and skillfully laid out. 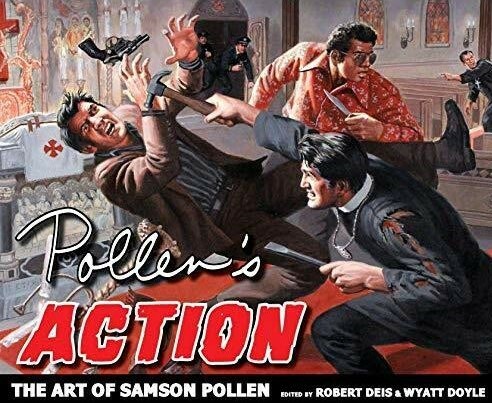 Samson Pollen was one of the premier artists of the MAMs and his work graced most of the more popular titles over several decades. Which is where Robert Deis and Wyatt Doyle enter the story. Both recognized the importance of the MAMs years ago and thus dedicated themselves to preserve as much of it as was humanly possible. They launched the Men's Adventure Library to release these marvelous collections. Through a series of beautifully designed books, Deis and Doyle have collected both the stories and the art of the MAM era. Last year they released their first volume dedicated to Samson Pollen; “Pollen’s Women,” and focused on the artist’s work in capturing the female form in all kinds of dire straits. Now we have this sequel book wherein the spotlight is on verve and energy Pollen gave his action drawings. Each is a master’s study in how to capture motion full tilt. Here is tense drama, nail biting suspence and over-the-top violence captured in a single breathless image for all time. The book is a veritable treasure to any young art student or fan of the pulps. We cannot recommend loudly enough and are damn happy to have it added to our own library.